Sled Island is dedicated to operating an environmentally responsible festival. We pride ourselves on working with festival attendees, artists, partners, Green Event Services and The City of Calgary to implement initiatives that make Sled Island and our community responsible environmental stewards. Sustainability is an integral part of Sled Island fun, and we encourage all to participate! Riding bikes is fun and, without a doubt, the best way to get around Sled Island. Thanks to Calgary’s cycle tracks, biking is easier and safer than ever. The tracks on 5th St. SW (3rd Ave. SW to 17th Ave. SW), 12th Ave. (11th St. SW to 4th St. SE), 8th Ave. SW (11th St. SW to Macleod Trail, excluding Stephen Ave.) and 9th Ave. SE (Macleod Trail to 4th St. SE) will take you to almost every Sled Island venue. For even more Calgary bikeways, check out Calgary.ca. Temporary bike racks are available at key Sled Island venues (see our venue map for details), but don’t leave your bike too long—racks get removed at noon on the final Sunday of the festival! Unclaimed bikes will be impounded. Need wheels? NOMAD Outdoor Gear Rentals offers great rates on an array of bikes. They even drop off and pick up rentals at no charge! Check out NomadGearRentals.com to learn more. Sled Island is continually improving our waste and recycling management as well as working to reduce waste at its source. We aim to make Sled Island an event that reuses, recycles or composts all waste. 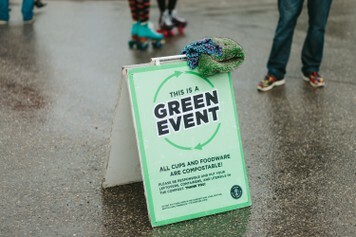 Everyone can be a part of our Green Team: sort your waste, recycling and compostables into the correct bins, carry a reusable water bottle and help our awesome volunteers keep the festival clean!